Randy Cassingham, founder of This is True and the Get Out of Hell Free card. In the warmup, Kevin talks about his road trip to pick up a new dog — this Twitter thread has details and photos. Gary talked about redoing his design for the MacMost site, and losing two computers to damage: his bulging battery story reminded Leo of his, and Kevin talked about a massive Fail in Apple’s recycling program. Gary asked, is the killer app for robots Love? The Verge introduces the Lovot. 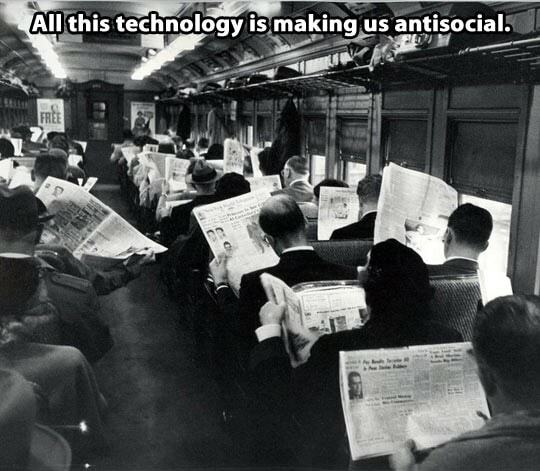 And Gary brought up the idea that phones kill social interaction: ain’t necessarily so. We talked about how this was raised about an earlier technology (see meme below), and Randy blasted the canard about “screen time” has “changed kids’ brains.” Techcrunch says that the science backing all this up isn’t really science. I too am a subscriber to HIBP — depending on how you sign in to websites and your password manager, it is slightly possible to see where the breaches have occurred. As I own my domain I have a catch all email setup and then every site I sign up to uses it’s own email address such as tehpodcast@. Then when a site gets breached and reported in hibp, the unique email address listed will let me know which site was compromised. The other way of doing it if you have a unique password for each site and I believe OnePass now has this built in, is to run all your passwords through the password check to see if they are in hibp. If they are, then the uniqueness of the password in your password manager can guarantee the site that was compromised. I was listed 6 times in this combo list — all of which were accounts that were previously leaked many years ago. Definitely a clever way to get insight.